Research shows that decision-makers are starved for time to discover and rigorously evaluate courseware. The CWiC Framework equips higher education to overcome this barrier in support of improved digital learning. Download the CWiC Framework or use online via LearnPlatform or EdSurge. 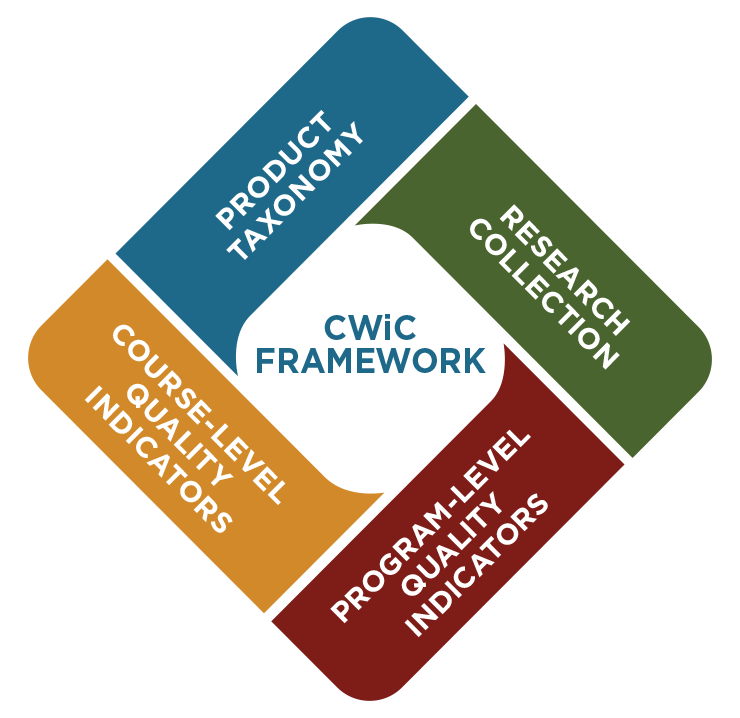 The CWiC Framework supports postsecondary decision-makers in effectively navigating the market of courseware solutions. It is designed to help you make better-informed adoption and implementation decisions with the goal of advancing the adoption of high-quality digital courseware in higher education and ultimately achieving improved outcomes for students. As a guide for broadening your awareness and equipping you with helpful decision-making tools, the Framework offers an inventory of product capabilities, as well as implementation considerations foundational to enhancing and improving blended and online teaching and learning with digital courseware.